You have a wide choice in 30-bottle wine coolers offered by retailers so it is a bit daunting to choose a unit the best suits one’s wine storage needs and budget. 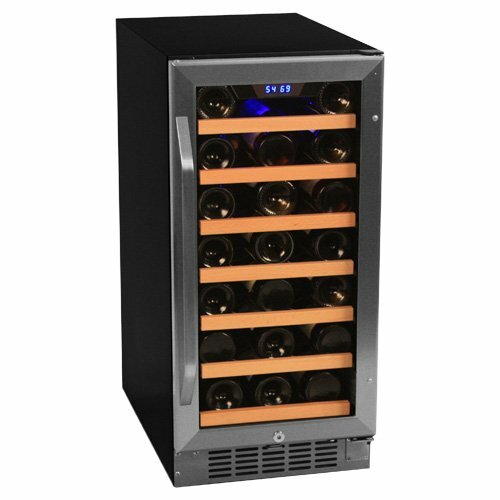 To help you narrow your search for a reliable small home wine cellar browse the following selection of the best-rated 30-bottle wine coolers available on the market. Most 30-bottle wine coolers are single-zone units, they don’t have two individually controlled compartments for chilling whites and storing/cooling reds. Many 30-bottle wine coolers use thermoelectric (also known as Peltier-) technology instead of traditional compressor-based refrigeration. 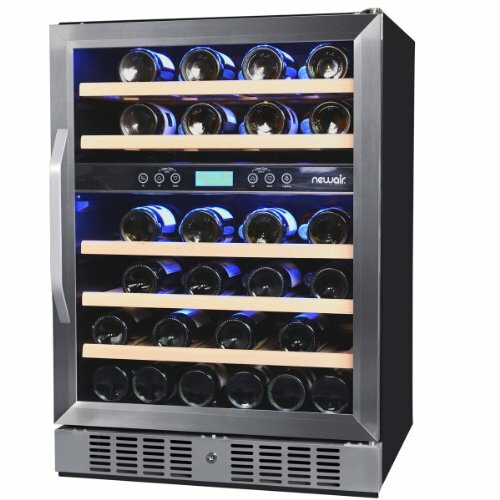 The 32-bottle wine frigde by Vinotemp is a popular choice because it is a moderately priced, compressor-powered unit that performs fairly well according to users. Price: cc. $620 – $700 ($19.4 – $21.9 per bottle). Find more Vinotemp wine refrigerators and details about a the company. Magic Chef 30-bottle wine cooler, Model MCWC30MCG – a cheap freestanding unit for under $300. Vinotemp VT-28TEDS 28-Bottle Wine Refrigerator – cheaply made thermo electric unit for standalone placement. 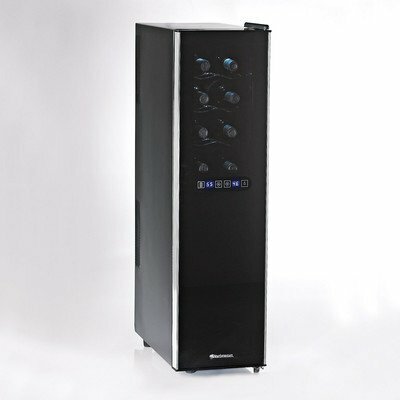 The EdgeStar 30-bottle built-in wine refrigerator received very good ratings by owners. Marvel makes higher-end refrigerators including elegant, compressor-operated wine coolers with full auto defrost. 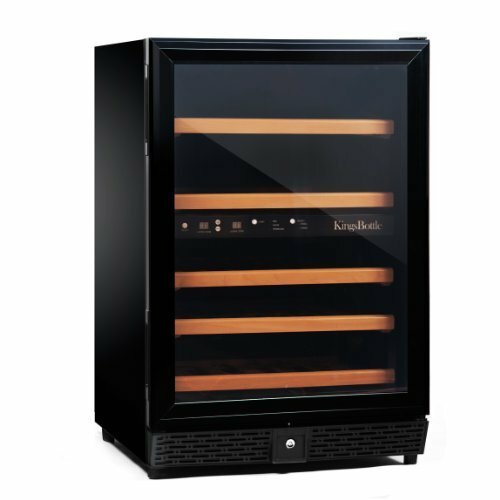 The Marvel Luxury Series 30-bottle wine cellar is an all-black unit: black cabinet with black-trimmed double-pane glass door and black interior. The door has an integrated full length bar handle. it stores 30 bottles of wine on 5 slide-out and 2 stationary metal shelves. The shelves are removable but the door has to be open for a minimum of 135º to be able to fully access and pull out the shelves. Temperature range of the cooler is 42ºF – 63ºF. low-intensity interior light that can be switched on/off manually or automatically. Front exhaust system and the 15″ width and counter-height makes it perfect for zero clearance built-in use. 5 year warranty on compressor and sealed system, and 1 year warranty on parts and labor. Price: cc. $1300 – $1400 ($43.3 – $46.7 per bottle). TIP: see other Marvel Wine Refrigerators and take a look at Marvel’s Chateau Collection Wine Cellars. The CWR301SZ model by EdgeStar is a single-zone, compressor-operated unit with lockable door and a an upscale look: black cabinet with stainless steel framed glass front, and slide-out wood-trimemd metal shelves. 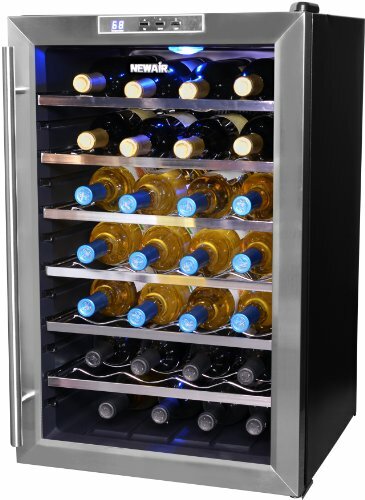 The EdgeStar 30-bottle wine cooler is one of the best-value option in the mid-sized, built-in category wine storages. 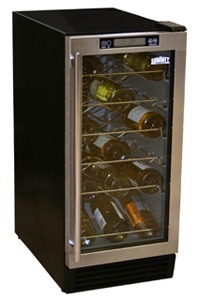 The Avanti 30-bottle wine cooler is a single-zone unit and is operated by compressor. It received fairly good reviews form owners higlighting the compact size, attractive look and reasonable price of the unit. Black cabinet with stainless steel-framed glass door which is tinted for UV protection and dual pane for maximum insulation. The 5 slide-out wire racks with natural wood front look elegant although they accommodate only bottles with max. 2 3/4″ diameter, wider bottles won’t fit. The curved stainless steel handle is removable. The lock on the bottom door frame is useful should you want to keep your wines locked away.. Direction of door opening is reversible. The adjustable electronic thermostat can be set from 45ºF to 65ºF. There are factory settings for red wine, whites or sparkling wine which can be selected by a touch of a button. Front venting allows for built-in or freestanding installation. In case of power outage the unit resets to factory defaults, you have to reset it to the desired temperature (if it differs from factory presets). Depth (with handle): 25″Price: cc. $650 – $680 ($21.7 – $22.7 per bottle). TIP: for a dual zone model with almost 30-bottle storage capacity take a look at the Avanti WC331DZD 28-bottle wine refrigerator. 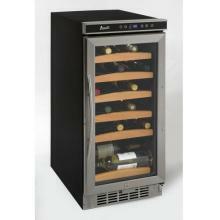 Read reviews of other Avanti wine refrigerators. This 33-bottle model by Summit is a narrow unit that can be conveniently built-in under the kitchen counter. With its black cabinet and silver-trimmed dual pane glass door it resembles the Vinotemp VT-32. Price of the Summit 33-bottle wine fridge: cc. $700 – $780 ($21.2 – $23.6 per bottle). Warranty: 5 years on compressor, 1 year parts and labor. The GE PGWS04HAESS is a compressor-based single-zone wine cooler for standalone placement made by General Electric. It is well-made, dependable and one of the lowest-priced units of all the 30-bottle coolers available on the market. Read a detailed review on the General Electric 30-Bottle wine cellar. TIP: Browse our list of overview and review articles on our Wine Refrigerator Reviews page.